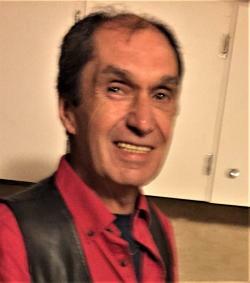 Durant, William David "Billy", age 68, of Pomquet, Antigonish County, passed away on March 2, 2019, in St. Martha’s Regional Hospital, Antigonish. Born in Glace Bay, he was a son of the late Rita Margaret (Durant) Benoit. Billy worked as a drywaller in Halifax for many years before returning home to Pomquet in 2010. He loved his old cars, four-wheeling, visiting friends, and having coffee at Tim Hortons. He is survived by his companion, Ruth Richard, sisters, Sylvia Benoit (Dean Byard), Fort Saskatchewan, AB; and Elizabeth (Wayne) MacDonald, Piedmont; brother, Robert (Charlene) Benoit, Camrose, AB; aunt, Jessie Durant, and many nieces and nephews, grandnieces and grandnephews. Besides his mother, he is predeceased by his stepfather, Peter Benoit, and several aunts and uncles. Cremation has taken place, and a funeral Mass will be held in Ste. Croix Church, Pomquet, in June.